If you’re like many leaders today, innovation has become a top priority. The question is: How can you build a culture in your organization that thinks in new ways and creates new products and processes over and over again? 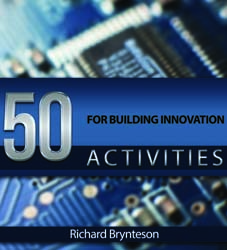 With 50 Activities for Building Innovation, you have a proven blueprint for creating centers of innovation throughout your organization that do just that. ● The Practice of Innovation: Give participants a shot in the arm and elevate their sense of innovation. ● The Innovative Personality and Skill Sets: Build individual, group and organizational skills. ● The Culture of Innovation: Create a culture that produces ongoing innovations. ● The Innovative Process: Encourage innovation using a proven, five-step process. Also included are questions to ask during each stage of the innovation process, inspirational quotes and sayings you can post and examples of innovation initiatives from the author’s own experience. You can use these flexible exercises in any order and adapt them to any time frame. With this powerful resource, it’s easy to shake up your next organization-wide innovation training, lunch-and-learn session, problem-solving meeting or team building event – and start building innovation into the DNA of your organization.